Partially dismantled 4-storey scaffolding has fallen away from the building onto the neighbouring unit complex. Partially dismantled 4-storey scaffolding on a multi-story residential construction site in Bronte has fallen away from the building and onto the neighbouring unit complex. No residents were in the neighbouring property at the time of the incident. There were no injuries reported. The residents were provided with temporary accommodation and a section of the road was closed while repair work occur. SafeWork NSW, NSW Police and the State Emergency Services responded to the incident and Engineers were on site to make the site safe. The site is located at Bronte. Activities undertaken at the site include the dismantling of scaffolding. The site is under the control of a principal contractor with the activity being undertaken by a sub-contractor. Each year SafeWork NSW respond to incidents where the safety of workers, or nearby people, has been at risk from falling scaffolding. 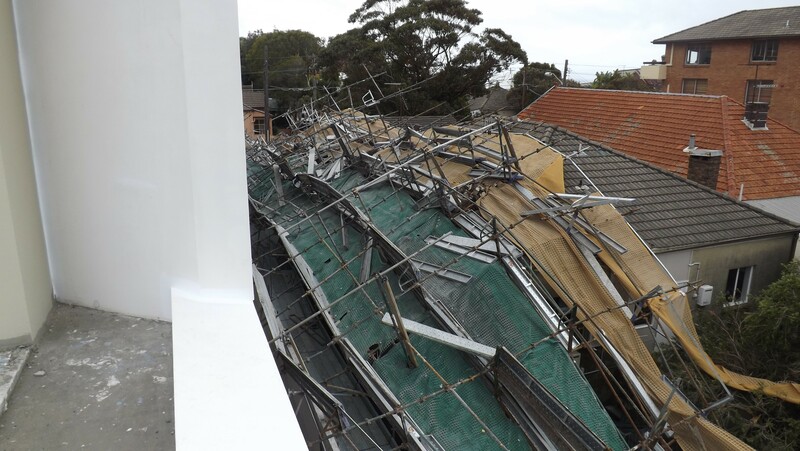 Many of these incidents involve scaffolds with containment sheeting (eg shadecloth or mesh) which may place extra weight on a scaffold, particularly in bad weather when wind and rain can place additional live loads the materials. A scaffold collapse not only puts workers lives at risk, but puts the public at significant risk of being hit by falling objects. scaffolds are not left in a state of weakness when installing or dismantling the scaffolds (eg removing returns as they act like ties, or removing ties in preparation for dismantling).